Ex-Manager of the Russian Troll Factory Moves to the U.S.
Russian TV channel “Dozhd” recently revealed that Agata Burdonova, who formerly served as one of the Foreign department managers at the notorious Kremlin-linked Internet Research Agency (IRA), now lives in the United States. 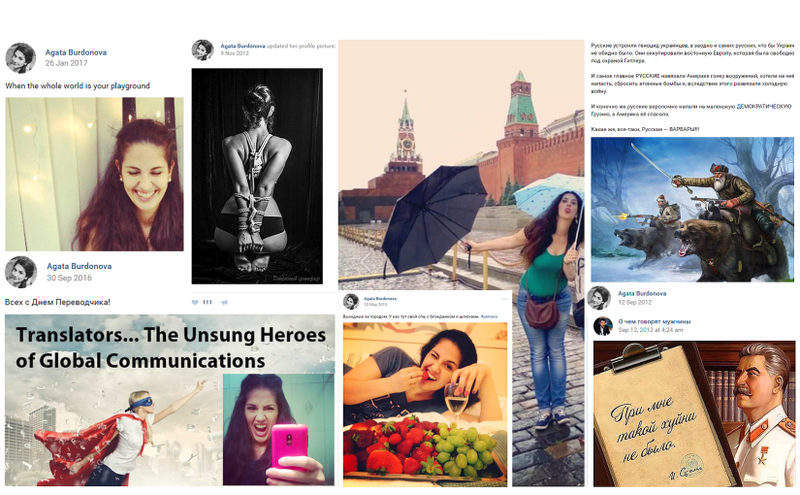 Burdonova wrote about moving to the U.S. on several social media pages she maintains. 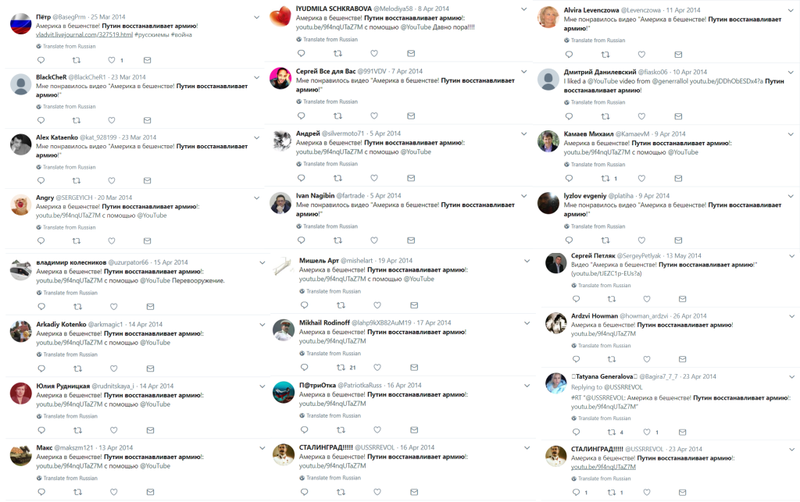 The IRA’s initiative targeting the United States was nicknamed the “translator project.” Burdonova’s self-described “professional level” of English proficiency undoubtedly came in handy during her work at the troll factory. She reportedly had an outstanding command of English and gave English lessons to other IRA employees. In order to target the U.S. most effectively, the IRA’s staff brushed up on their knowledge of English and concentrated on studying American politics, cultural and social issues. Much of the Russian influence operation unfolded on Facebook, where the IRA’s trolls posed as Americans, created fake personal accounts and pages, organized rallies, purchased ads and engaged in other activities related to Russia’s interference in the U.S. elections. Some of the IRA’s employees traveled to the U.S., conducting reconnaissance and collecting intelligence. On February 16, 2018, as part of his probe into the Russian interference in the 2016 election, Special Counsel Robert Mueller charged 13 Russian nationals and three Russian entities with an illegal “information warfare” scheme to disrupt the 2016 presidential election. Prior to being scrubbed, Agata Burdonova’s LinkedIn account revealed that from 2014 to 2015, she worked at Mix Info – one of the companies named in the recent indictment from Special Counsel Robert Mueller’s office. Mix Info is alleged to have been one of several fronts used by the Internet Research Agency (IRA). Burdonova’s job description and employment at Mix Info/IRA happens to coincide with the activities named in Mueller’s indictment – namely, the “Translator Project” that was set up in April 2014. Burdonova’s LinkedIn account revealed that her work at Mix Info consisted of translations between Russian and English, managing social media accounts, and creating content about news, history, culture and economics. 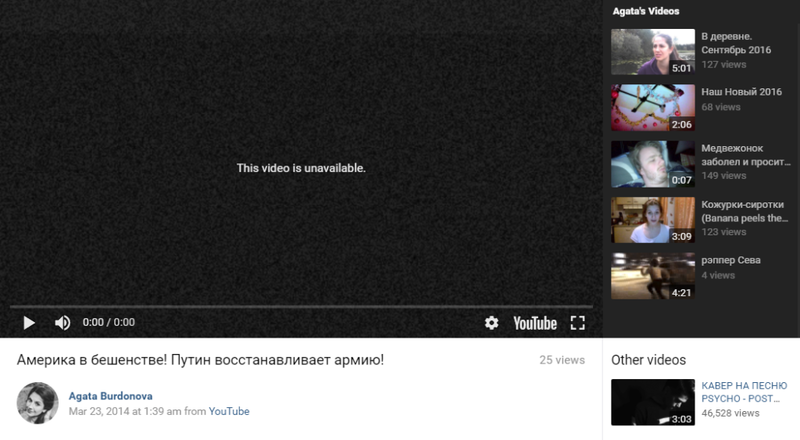 In 2014, Burdonova posted a YouTube video, entitled: “America is furious! Putin is restoring the army!” The same video has been shared by numerous Russian bots and trolls, across different social media networks. 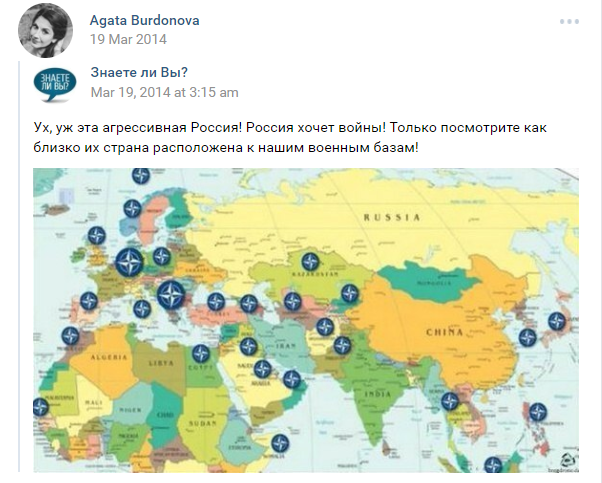 Burdonova also shared social media posts complaining about NATO’s military bases surrounding Russia, which have been extensively disseminated by Russian trolls and bots on various social media platforms. In her social media posts, Burdonova described traveling to work “near the Black River subway station” in St. Petersburg, taking a cab from the subway station to her job. 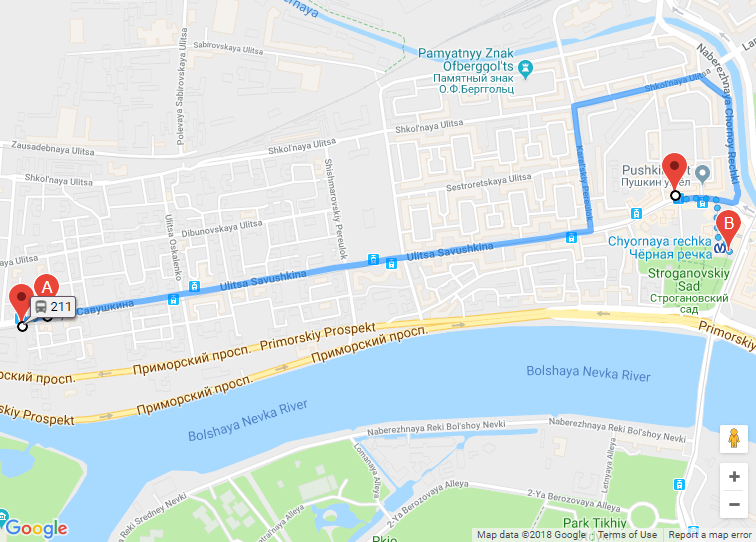 This corresponds with the address of the IRA troll factory: 55 Savushkina Street, St Petersburg, located in the near vicinity of the “Chyornaya Rechka” (Black River) subway station. 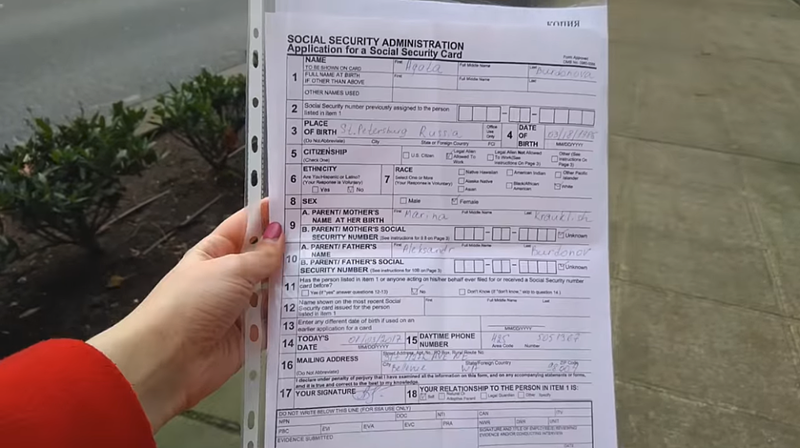 Agata Burdonova was not named in Mueller’s indictment of the IRA employees. Burdonova’s former IRA boss, Katarina Aistova, headed the Media and Public Forums department. Aistova’s boss, Dzheyhun Aslanov – the head of the IRA’s Foreign department – is one of the persons named in Mueller’s indictment. Immediately prior to Burdonova’s move to the United States, in December 2017, she remained in close contact with Aistova. 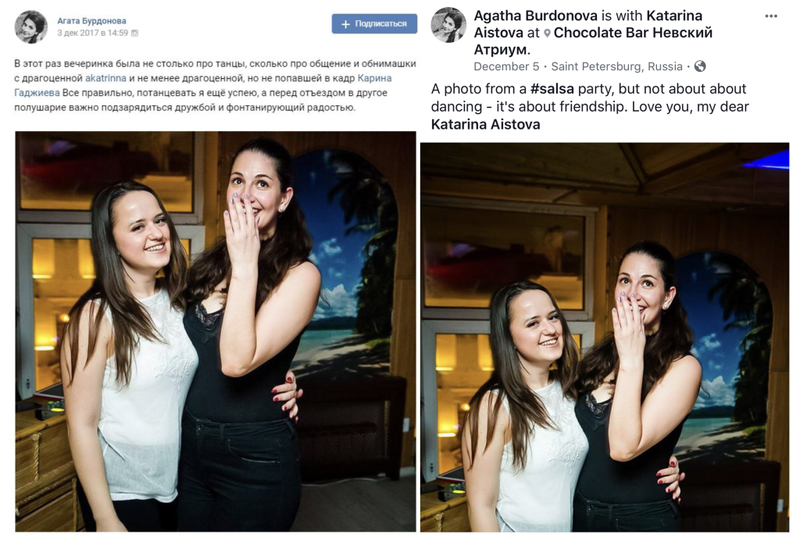 In fact, the two celebrated their friendship and Burdonova’s imminent departure for the United States at her farewell party, as documented in Burdonova’s social media posts on December 3rd and December 5th, 2017. On December 7, 2017, only several days after partying with her former IRA boss and close friend Aistova, Burdonova was on her way to the United States. 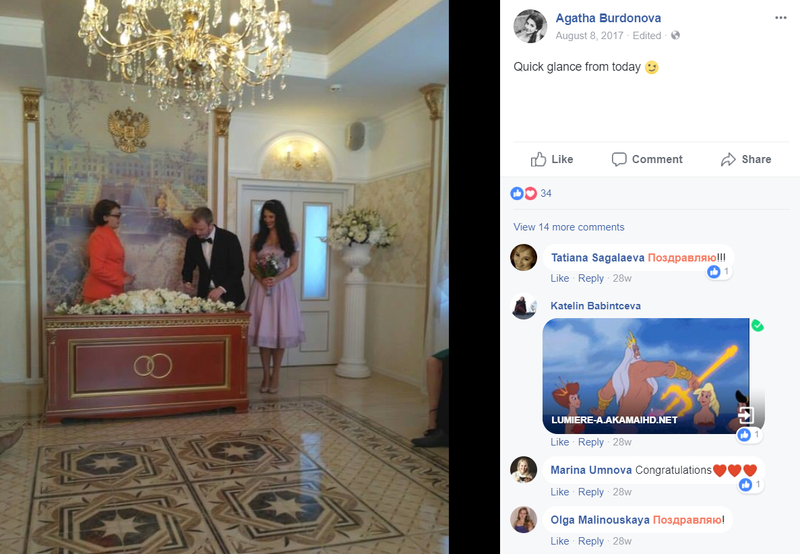 Burdonova’s social media posts reveal that she has been dreaming of “marrying an oligarch” and “moving to another country” for years. Burdonova didn’t end up with an oligarch, but she was able to obtain a U.S. visa as a dependent of her husband, Dmitry Fyodorov. On June 15, 2017, Dmitry Fyodorov publicly stated on his social media page that he received an employment offer from Facebook*. 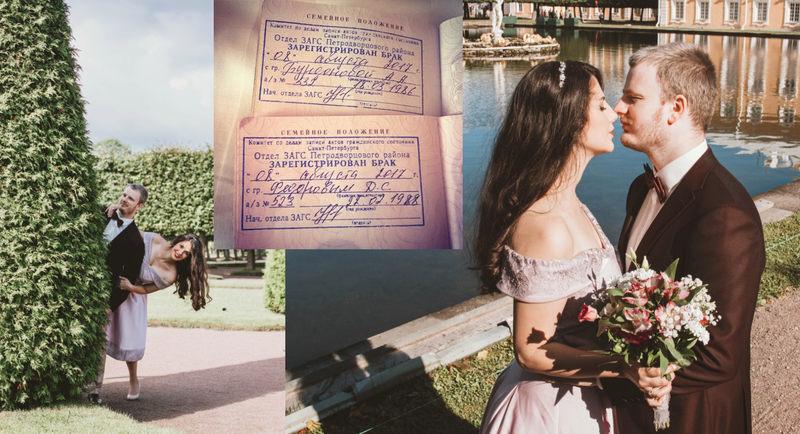 Only weeks later, on August 8, 2017, Fyodorov married Agata Burdonova, thereby securing her admission into the United States. Fyodorov’s U.S. employer sponsored his and his new spouse’s American visas. 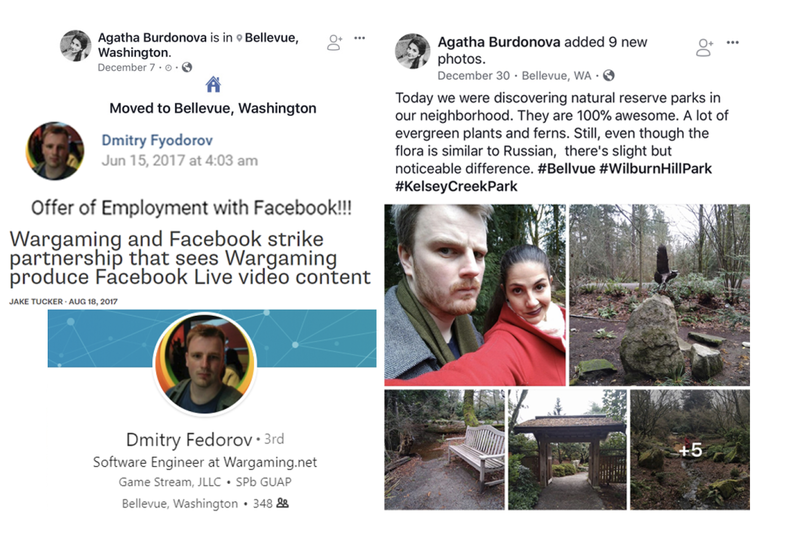 In social media posts, Fyodorov said he was traveling to Seattle “for several years” and Burdonova applied for a Social Security number as a “Legal Alien Allowed to Work” in the U.S.
*Facebook denied employing Fyodorov or sponsoring Fyodorov’s and Burdonova’s visas. 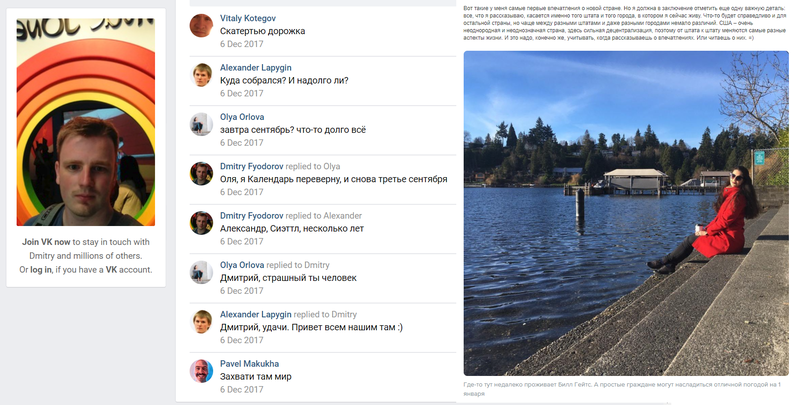 However, Facebook did not deny making Fyodorov a job offer. 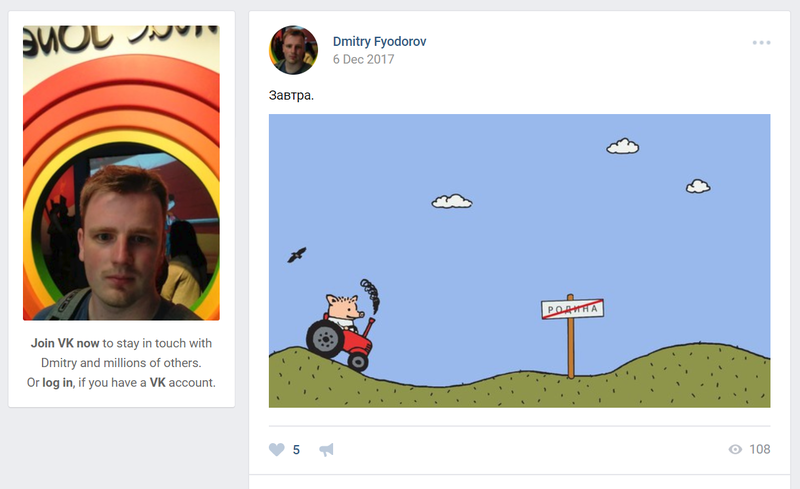 Dmitry Fyodorov’s LinkedIn profile (wherein he is listed as “Dmitry Fedorov”) states that he is currently employed by Wargaming.net. That is likely the company that sponsored U.S. work visas for Dmitry Fyodorov and Agata Burdonova. ‘Wargaming’ was founded in Minsk, Belarus. It is headquartered in Nicosia, Cyprus, with subsidiaries in Chicago, Illinois, Hunt Valley, Maryland and Seattle, Washington. On August 18, 2017, Wargaming and Facebook announced that a deal has been struck, wherein Wargaming will produce Facebook Live content. Wargaming will provide more than 1,000 hours of live and on-demand video content for Facebook’s Facebook Live video service. 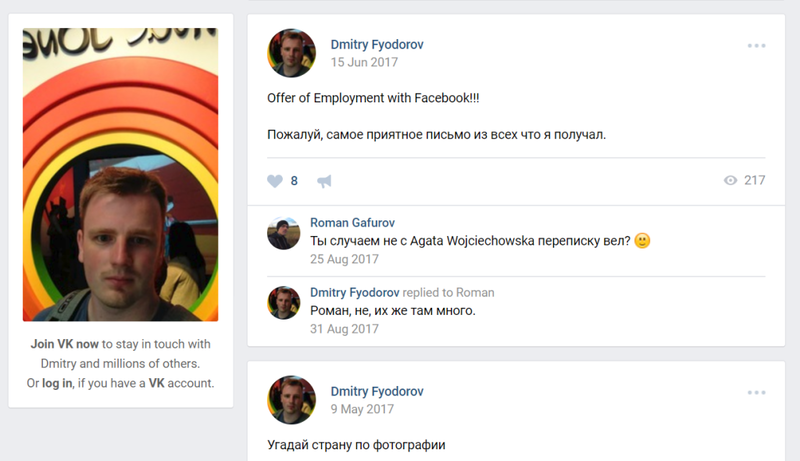 This seems to explain Fyodorov’s announcement of receiving a job offer from Facebook, although he is technically working for Wargaming. Fyodorov was interviewed and admitted that he came to the United States on an L-1 visa and Burdonova on an L-2 visa, sponsored by Wargaming. Special Counsel Robert Mueller’s office is aware of Burdonova’s presence in the United States, but declined requests for a comment.